Charles Nunn (Junior) was born in Norton in 1918; his father was also Charles Nunn (Senior), from Pakenham, and his mother was Mary (née Price); he was the youngest of five, having three brothers and a sister; his grandparents had passed on so he never knew them. He went to school in Norton, and attended the Baptist Chapel. The minister there was responsible also for Elmswell and Bardwell; it was the custom of young people (in their late teens) at that time to go over to the other chapels for Festivals, so he would cycle with the others to Elmswell. In 1938 they came over for the Baptists’ harvest festival, where he and his pal met up with a very nice young lady and her pal. Charles only remembers one thing about the sermon: Rev. Cook’s maxim “Never do your courting in a cornfield – there are too many ears about!” For the rest, his attention was elsewhere… Things blossomed, and he married Ivy Miller on her 21st birthday in 1941. By then Charles had been called up (see below) and they could see each other only now and again. Ivy and her sister worked on a fruit farm at Risby, and lodged there. When baby Maureen was born in 1943 he made a dash by train and hitch-hiking down from Yorkshire to her parents’ home in Rose Lane. For a while Ivy went back to the fruit farm in Risby, living in digs and carrying the baby around with her, then moved to a Wetherden Road Council house, subletting from Tay Armstrong, who drove an LNER lorry from the Elmswell depot to surrounding villages. Three months before Charles was demobbed in March 1945 they had to relinquish their rooms to the Armstrong family, and were lucky to have use of the temporarily vacant Baptist Manse in Norton. In May this, too, was needed, and for the next year they “squatted” (as so many had to do, at that time) – in an ex-USAF radio hut at Rougham. Here their son Roy was born. With his mechanical training Charles got a job with Bill Brazier at Thurston garage (now Cracknell’s), but he was not very happy there and was glad to be taken on at F J Nunn & Sons, soon moving into one of their houses opposite the works in Ashfield Road. Their children went to Elmswell school. The headmaster was Mr John Palmer, who had been Charles’ teacher in Norton. After 12 years they moved from Ashfield Road to ‘Elm View’ in Church Road, which was then the eastern half of St John’s House, where they could have three bedrooms instead of two. At the time the whole building was rented by Miss Nora Head (for whom Ivy had been working) from Kate Green, who also lived in Church Road. The house had been divided in two, the Elm View part being occupied by Miss Head’s companion. When the latter moved to The Cedars, Miss Head invited them to sublet it, a shrewd manoeuvre, as before long Ivy was having to do things for the old lady. After 18 years, by which time Maureen and Roy had moved away, Miss Head retired to Hanover Court, so they had to leave too; Charles then bought the house next to the Tate&Lyle depot from Ernie Goodfellow, the butcher; they christened it “Sawmills”. Ivy died in 1990. 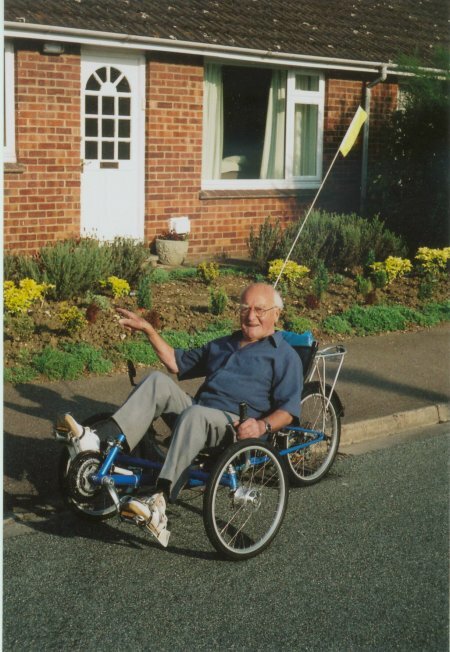 Charles eventually found the garden too big, and as he was denied planning permission to divide the property and build an additional bungalow, he moved to Millers Close instead. Music was always an important part of Charles’ life. He was the only child in his family who had some piano lessons, when he was 8, but at home they had only a harmonium to practise on; his enthusiasm waned, and his parents naturally had not the money to waste, so the lessons were stopped. But when he was 14 or so the Norton Sunday School hadn’t anyone to play the pedal harmonium, so to fill the gap he taught himself, and sometimes even played for church services. Then his uncle gave him a violin, which he still has, loaning it out to deserving cases. Singing was the great thing: his father and the three sons formed a quartet, and they went to various churches to perform for special occasions. In the forces Charles started a male-voice choir. Years later Bernard Wainwright started the Beyton singers, with whom Charles sang for 38 years – he was sad when it folded, but still sings with the Tudor Rose singers. Charles still plays bowls – he has been at it 30 years now; Ivy used to play too. Photo below taken outside St John’s (spot the hidden Rector) on the occasion of one of the first Suffolk Historical Churches Cycle Rides. Chas. is seen with Ivy, his late wife, and their folding bikes. They were keen caravanners, so collapsible cycles made sense, if not the best machines for long distance. And long distance it has been. For Chas every year since has seen him clocking up the sponsored miles. . . 39 churches his record in any one trip, this year 19 on his splendid ‘recumbent’ which is gentler on his knees. Ivy was a Methodist, and Charles was quite content to make the change from Baptist. At that time there was a small pipe organ: Lucy Nunn (Frank’s sister) played it – she lived on the right past the Baptist Chapel. A lady named Madge Catling (who lived at the last house in Ashfield Road before Whitehouse Farm, then Hicks’ Farm) was running the Methodist Sunday School; one day she came to him at home and asked if he would take over, as she was getting married and moving away. He had done some such teaching in Norton, so he decided to give it a go (this was in about 1947). He changed some things at once: for example, she had conducted the classes from up there in the pulpit – somewhat distant, he thought, so he stood below at a reading desk. There was a grand company of teachers, eventually 10-12 of them, as the number of pupils gradually built up to 80-90; fortunately the kids were better behaved than these days! He ran a teachers’ training class once a fortnight, so they could follow a proper syllabus; he organised a junior choir to lead the singing on Sunday mornings, and a senior choir in the evening. They also held a ‘Sunday School Club’ during the week, age-split under-8 and 8-17 years old. Eventually (c.1955) the Wesley Hall was built. He gave up the Methodist teaching when he fell ill, and a younger person took over, but he occasionally helped by playing the piano. He remembers the Rev. Don Bullen doing the History of Methodism in Elmswell; he had been a junior minister, and came back later as a minister in the Bury Circuit. (Charles is not knowingly related to the Frank Nunn family). According to Charles’ recollection, Frank Nunn bought the business from Nathan Warren in about 1909 (? ); previously he had been chauffeur to a Woolpit doctor; he was himself from Drinkstone, perhaps from a blacksmith’s family there? There had been two blacksmiths, and Nunn retained one of them, Ted Nicholls, for many years. Frank had three sons – Edward, Bill and Peter, who all took a hand in the business when they were old enough. In the early days they had two oil-fired engines which pulled 10-12 furrow ploughs across a field, on a big drum of cable mounted underneath; the plough had two lots of ploughshares, and by tilting it they were used alternately for the two directions of ploughing across the field. Charles himself joined the firm in 1947, not being very happy with his previous job in Thurston. At that time he was in the workshop (for which his wartime training served him well), where tractors were brought in for repair; they had to fabricate a lot of the parts as they were unavailable. Nunn’s was an agency for Minneapolis Moline tractors. Some things they couldn’t do, such as cylinder boring or big ends, so these had to be sent out. There was no original product manufacture, (though they were probably still making horse-hoes when Charles started!). Ted Nicholls was still there, very skilled he was too – he could do such jobs as the iron rims of cartwheels, etc. Sometimes Charles helped him: Ted taught him how to use a hammer properly, and swore at him one day for holding the hammer part-way up the handle. Charles worked at Nunns till retirement. He had a van and went out on calls to do repairs at farms, and was 12 years in charge of all service; then Edward came to him one day: Derek Moys the rep was leaving – would he take his place? They sent him on a Massey Ferguson Sales training course to Stoneleigh Abbey. Charles didn’t at all like the Americanised style being taught, but Edward encouraged him to just “be yourself!”, and off he went, selling new tractors and combines over the period 1969-73. Frank had died before this and the sons had expanded, first to Downham Market (Bill Nunn in charge) and then Kennet (Peter). 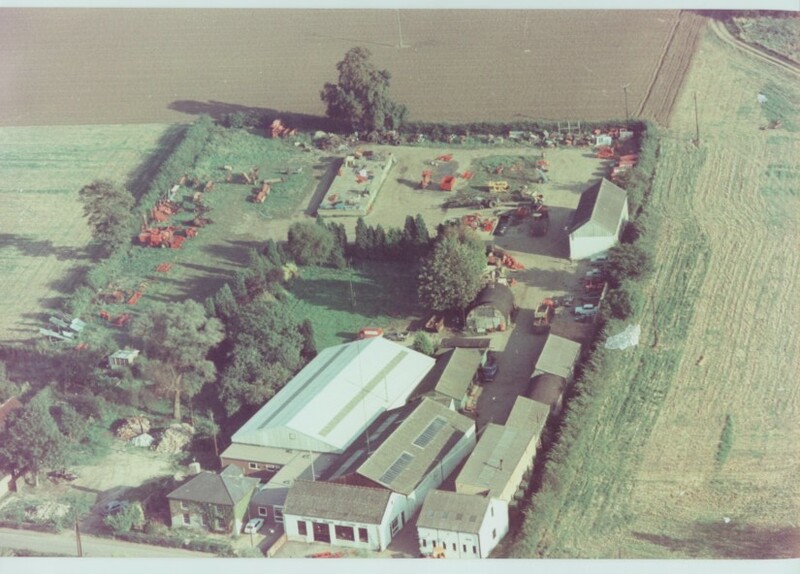 Later on, John Thurlow in Stowmarket also had a Massey Ferguson franchise, and perhaps economy dictated merging; then a few years later Standen too. Looking at the aerial photo of Nunn’s, Charles recalls the various buildings, many made by shuttering – concrete poured between boards, using 6 foot scrap blades for reinforcing! All the buildings were built in Nunn’s time, except the blacksmithy traverse(?) and forge; previously at the roadside, when Charles joined it was taken down the yard to the Anderson shelter. The old house (where Nathan Warren had lived) was ‘The Laurels’. An overgrown tennis court can be seen in the middle: the Nunns played and Charles too, and other Methodist folk (the Nunns were devout Methodists). They also purchased three of the houses (grey brick) over the road from the site, for renting out to employees. Charles’ family moved into the 3rd house along. Ivy’s grandfather Jonathan Miller, and then father Bert, had a carrier business running a service to markets etc, Bury and Stowmarket. Bert used horses originally, and also supplied horses to pull the tarpots when they started macadaming the roads. For years he towed the Elmswell fire engine: to start with this was a longish machine with a long wooden handle on either side, 4 or 5 men to each handle. He remembers it visiting Norton for a demo, the only time he saw it himself. Later it was replaced by the Greene King steam tender. The business was in Rose Lane, the first locally to have a petrol lorry; George Hurst used to drive for him, and Bert’s son Ron who eventually also took over, but for health reasons Ron couldn’t carry on and the firm folded. Spencer Farrow, working for Rand’s, took bread round the villages in a van. Doesn’t think Mr Kay’s shop was initially owned by Mr Leeks; it was roughly where the bus-shelter is, on that corner of Prescott, a brick building, demolished when Prescott houses were built. Fish shop just past the Fox, before Goodfellow’s; ‘Crew’ Stiff used to run that. Jubilee Avenue (only, in the early days), no estate buildings there at all; footpath from Bennett Avenue corner of Cooks Road, across the fields to where Jubilee Avenue finished on Wetherden Road, walked it many a time, stile. Wrights electrical shop was in the same building where Lufkin was later. Reg Snell worked for Mr Wright doing all the repairs there. Garage on the corner of Oak Lane; son was C’s age. Ozzy Wyatt the sanitary inspector, whose son became a doctor. Durrant the saddlemaker on the corner of Grove Lane; his sisters outlived him, very old when C moved there. Leonard Pearson’s father farmed a small acreage up Ashfield Road. Charles Rudland married Leonard’s sister. He was called up in January 1940, and trained at Felixstowe for 8 weeks on the prom in the snow; a bitterly cold winter – he remembers digging an Eastern Counties bus out of a drift in Trimley. Next to Chipping Norton RASC (Service Corps) unit (transport, night driving without lights…). And on to Scotland: they were due to go to Norway but the Allies withdrew, so they had 14 days holiday at Troon on the west coast; here he learnt to swim. They provided transport for Glasgow and surrounding areas. The company had 3 sections: food, petrol, armaments. Next stop Cobham in Surrey, to transport returnees from Dunkirk dispersed all over. He will never forget the night when, coming out of the flicks and looking towards London, they saw a great blaze of light – the first night of incendiaries. The division moved to Thorton-le-dale (Yorkshire); the 12 went on strike when told they’d be 2nd drivers to new boys, so they were sent back to their original unit. 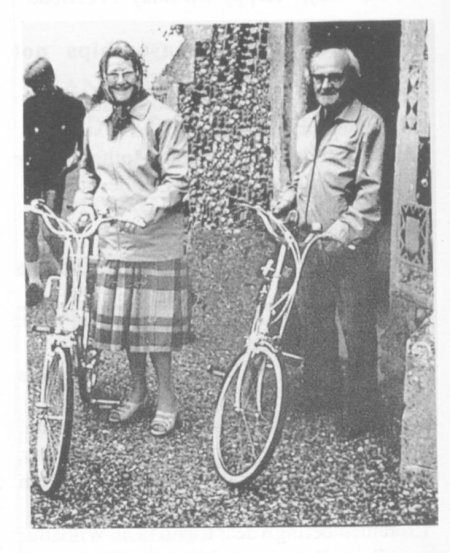 From a tribute in the Elmswell Newsletter, October 2005: Photo taken outside St John’s (spot the hidden Rector) on the occasion of one of the first Suffolk Historical Churches Cycle Rides. Chas. is seen with Ivy, his late wife, and their folding bikes.